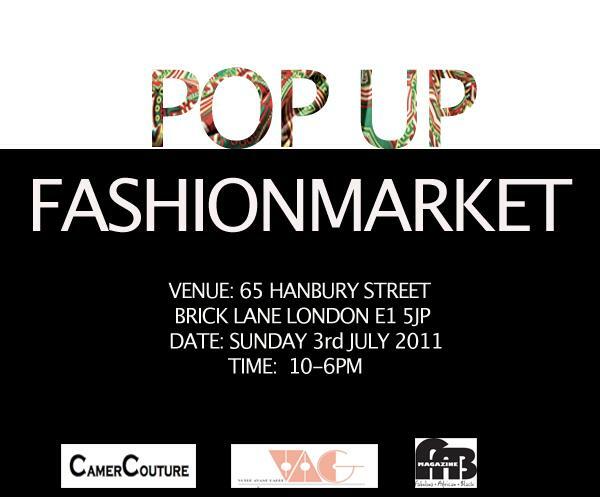 Votre Avant Garde (VAG), the creators of critically acclaimed fashion show, CamerCouture are set to makeover summer wardrobes with their latest project, Pop Up FashionMarket. A trendy bazaar connecting emerging fashion designers and creative businesses with new markets, the event is scheduled to take place at the Real World Gallery in London’s Brick Lane. 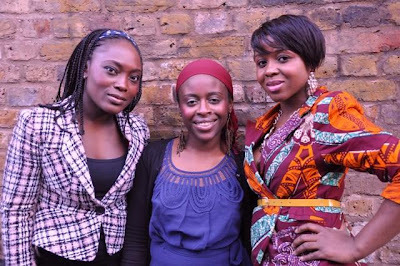 It will feature creations from fashion and accessories designers, artists and beauty product sellers. “The Pop Up market is an off-shoot of CamerCouture,” explained VAG CEO, Cynthia Anduhtabe.“We realised that people enjoyed the fashion shows immensely but also wanted effective ways of purchasing the designers’ unique creations and keeping up to date with their work. However reaching their favourite designers and discovering new ones is often not easy. Our Pop Up FashionMarket presents a reliable and fun solution to this problem by offering great place for creatives and fashionistas to meet and build lasting relationships,” she added. The fashion executive is also confident about the value this event - which has gained interest from VoxAfrica TV, glossy magazine, FAB and various bloggers - will deliver for participating designers.“With thousands of regular visitors, Brick Lane is a pulsating fashion hub which bears a bright, multicultural stamp. There’s no better place to venture into new markets and test business ideas,” she observed. 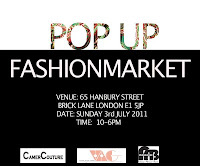 Fashion labels, Amechi Ihenacho, Asakeoge Couture, Rouge by Rachelle, Yaa Ataa Bags, Rococo Chichi, Moko, Nkya and are among participants for the event, scheduled for Sunday July 3rd 2011. Products from hair line Souki will also be on sale. For information on how to acquire a selling space, please contact Cynthia Anduhtabe on: 07834 321 373 and take advantage of our promotional offer of £65 for fashion and accessories designers and £35 for beauty products.